My new Pond Paddock garden bench deserves its own page. Fifteen years ago I bought my first piece of garden furniture - a kitset park bench - and placed it in the Pond Paddock underneath some Tree Lucernes. This (the original Pond Paddock bench) didn't stay here for long. Now, all these years later, I've bought a worthy replacement bench and installed it in exactly the same place. So sitting here brings back heaps of early garden memories. 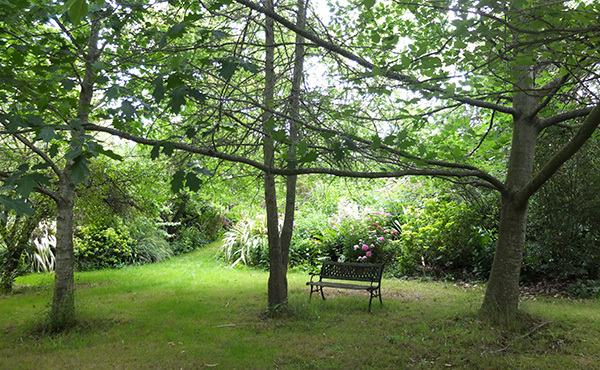 The garden borders which surround the Pond Paddock have crept outwards, their middles filled up with shrubs and roses. The Oak trees in the lawn have grown huge, giving summer shelter from the sun. The Pond has stayed the same shape, though its plantings have expanded. Fifteen years is an eternity in a country garden! The new garden bench was a birthday present from me to me. Initially rather wobbly, it's been given a full check-up by Non-Gardening Partner and is deemed fit for action. You'll see a golden Choisya Ternata shrub behind it, in late spring blossom. 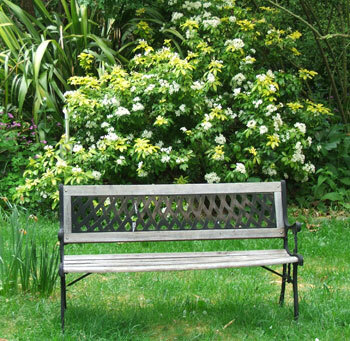 Earlier a patch of lawn daffodils would have been flowering alongside the seat.